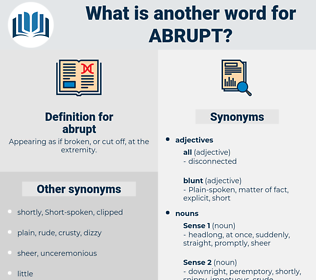 What is another word for abrupt? Appearing as if broken, or cut off, at the extremity. rapid, surprising, harsh, sudden-onset, short-notice, rough, rugged, snap, rude, unannounced, untimely. 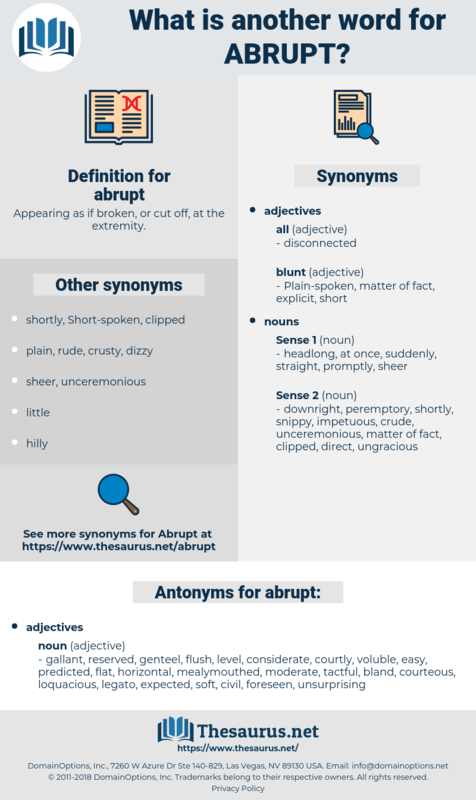 sharp, steep, brutal, unexpected, precipitous, dramatic, drastic, brusque, brutish, surprise, blunt. gallant, reserved, genteel, flush, level, considerate, courtly, voluble, easy, predicted, flat, horizontal, mealymouthed, moderate, tactful, bland, courteous, loquacious, legato, expected, soft, civil, foreseen, unsurprising, unruffled, smooth, plane, politic, polished, urbane, unwrinkled, refined, even, talkative, anticipated, genial, gentle, polite, suave, diplomatic, cultivated. It had almost as much of a pitch as the upper part of the first drop of Surprise Rapids down to the abrupt fall. When she had finished, Canon Wilton said, in his rather abrupt and blunt way: Well, but if your husband comes home unexpectedly?